Today, it is fair to say that nearly any application depends on distributed and service-based computing of some sort. This is most apparent in the mobile and cloud computing areas but this trend is quickly affecting essentially all areas of computing. Despite this natural and comprehensive demand, most interestingly, there is to date no established middleware that provides dependable high-performance over a wide range of configurations and deployments, offers rich in- built QoS and Security features, while at the same time facilitating the development of diverse applications across a wide range of heterogeneous devices, infrastructures, systems, and domains.This mismatch between supply and demand became early and especially apparent within FI-WARE (www.fi-ware), which is developing a large-scale, distributed, cross-technology Future Internet platform for a large set Use Case projects in different application domains. The goal of KIARA is to provide a “Middleware for efficient and QoS/Security- aware invocation of services and exchange of messages”for the FI-PPP program and beyond. 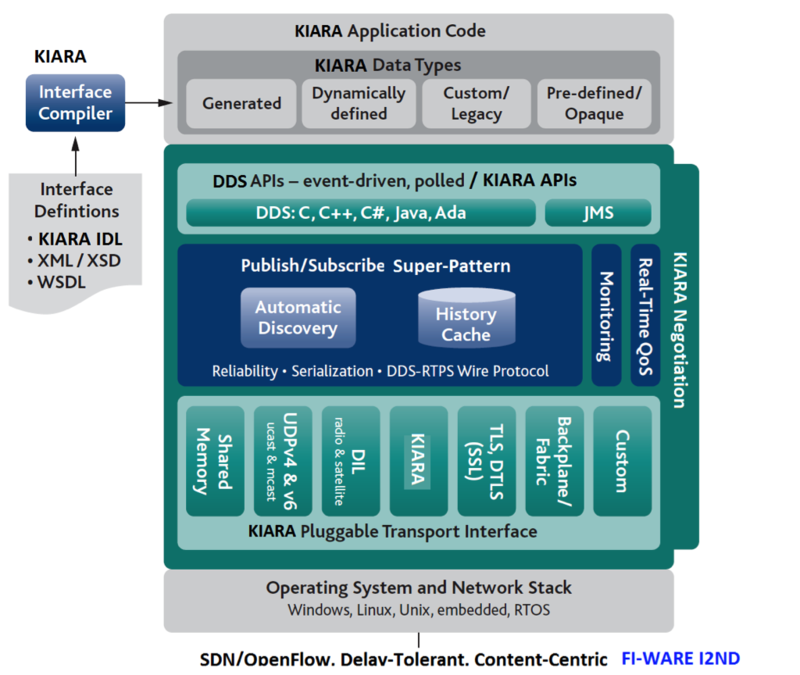 KIARA builds on top of a well-established, proven, and high-performance product RTI-DDS from RTI and combines it with innovative research results to provide an advanced middleware layer that targets the specific requirements of the Future Internet. KIARA provides radical improvements in performance and scalability not only for traditional Web services, but also for distributed applications in general – ranging from tiny devices in the Internet of Things to high-performance computing applications. KIARA improves developer productivity and greatly simplifies application integration using a simple-to-use IDL for specifying the communication contract between peers as well as a novel API that allows applications to communicate in terms of their own data structures. KIARA dynamically and transparently selects the optimal communication mechanisms, protocols, and data representations to be used between two peers, including the traditional SOAP/REST protocols but also optimized binary formats and mechanisms like pointer forwarding, shared memory, and the use of specialized network infrastructures. An embedded compiler dynamically at run-time generates highly optimized code that transfers messages directly from application data structures to the network. KIARA uses simple, high-level specifications of QoS and security requirements from the application for automatically selecting the best communication strategy, thus clearly separating the high-level concerns of the application/developer from the concrete and varying technical details, such as the available network and other capabilities and resources. KIARA, for the first time, uses a “Secure By Design” approach for of the communication architecture, thus trying to eliminate network connections as the dominant source of security threats. This combination of a well-proven, existing middleware product with unique features based on latest research results forms an ideal basis for efficient and QoS/security-aware communication within FI-WARE, the FI-PPP program, and for general distributed applications. KIARA is a European research project funded by the European Commission. As winner of the FI-WARE Open Call 1 for additional beneficiaries it is an integral part of the FI-WARE project. It runs over a period of 20 Month with a total investment of roughly 1.6M Euro. The 3rd European Summit on the Future Internet was hosted by TIVIT in Helsinki. After attending the first event, presenting SAP’s Future Internet vision, Thomas M. Bohnert was invited again this time presenting latest insights into the evolution, status, and near future of the FI-PPP from a program-level (CONCORD) perspective. In this guide we’ll explain how you can setup a simple OpenStack all in one installation using puppet. In this guide we’ll be using a virtual machine to simulate the hardware. We’ll use the same network configration as was used [in the article on Foreman](http://www.cloudcomp.ch/2012/06/automating-the-icclab-part-one/). We’ll also be using Ubuntu 12.04. Of course feel free to use what ever other values you like to use. Performing this configuration will ensure that resolvconf always generates settings with your values. Once you have the virtual machine installed, it might help you if you take a snapshot of the it at this stage so that you can roll-back to a fresh state. In order to deploy OpenStack, we will be using puppet in both agent and master mode. ***Note*** that this particular configuration will change when we integrate with Foreman in the article describing Foreman, puppet and OpenStack integration. **Note** that this LVM mapping is reset on reboot. 4. Go back to your web user interface and you will see that there is now a VM image to instantiate and execute. By the way, the puppetlabs OpenStack github repository [has some decent documentation](https://github.com/puppetlabs/puppetlabs-openstack). We've now successfully installed an "all-in-one" OpenStack using puppet. In the next article we'll look at expanding this to a multi-node scenario. Stay tuned!